I have now been lucky enough to travel the Great Ocean Road a few times. Once, with a tour & once hiring a car and driving down for the weekend. So I feel as though I can give (a few) tips on what to see & do. Go in Winter. Off peak season – less tourists, less cars on the road – you actually get places quicker. Also hot spots such as The 12 Apostles are a lot quieter and you can take all the photos you like. Another advantage of this is that things such as rental cars are a lot cheaper. We got this bad boy below from Avis Rentals and it cost us $130 for 3 days! Bargain! Comfy, reliable & safe with great fuel economy. Great for road trips such as this! Obviously this is Australia and what would a trip be without seeing some of the locals. My favourite spot to see these is a little place called Kennett River. You are (almost) guaranteed to see some of these guys on a trip here! It’s pretty cool. They are definitely there, but you just need to keep your eyes peeled as Koalas especially blend in with the surroundings really well. Look higher up than you think – including the really small branches you don’t expect the koalas to be. Go early in the morning! By about 11am, there will be so many tourists that you can not move and also buy some seed from the ‘Kafe Koala’ to get a chance to get up close & personal with some parrots & cockatoos. we discovered the Thunder Cave which is quite possibly one of the coolest parts of this place! This little town is the perfect place to stop for a snack, a quick beach trip or lunch along the Great Ocean Road. Its about smack bang half way between Melbourne and the 12 Apostles – right before heading into the Otways! Because of this, this is also the place we decided to stay for our weekend trip. We booked a motel last minute and there were many to choose from (even in winter). Most of the Motels & Hotels are really close to the centre of the town (we stayed here . ), so everything is really only a 5-10min walk away which is perfect! Great Ocean Road Brewhouse – Great dinner options. The food was really good pub food and the atmosphere was great. Get the Lamb & the date pudding, dreamy. The Bayleaf Cafe – Breakfast and coffee both top notch! I’m not gonna lie. I am not the most adventurous person. However, one thing I have always wanted to do is ziplining (don’t get excited, I did not go ziplining) and when I discovered a place that had this, I was (almost) sold. We then did some googling and discovered that for this trip it wasn’t in the budget. 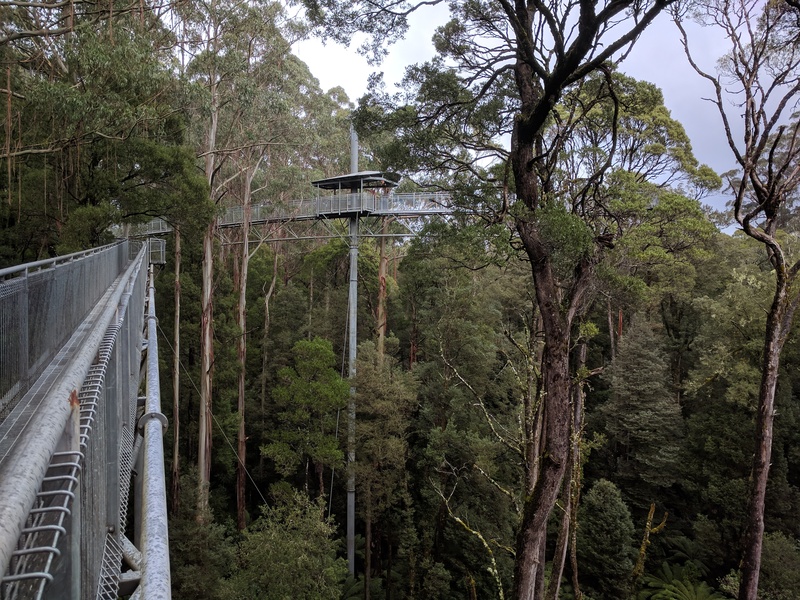 BUT they also had a more reasonably priced activity, which was The Canopy Tree Walk and it was awesome. The walk itself is the tallest and longest of its kind (at this point). Its around 600 meters long and 35 meters above the ground, so maybbbbeee not your thing if you don’t like heights! There is also a spiral tower which goes up an extra 12 meters above the ground and gives you an amazing view of the forest! But, be aware, it does sway around with the wind which can be a little unsettling! Strangely enough, this area of Victoria has a sheitload of breweries, wineries and even a whisky distillery. We stopped by a brewery near Forrest called Prickly Moses and it was pretty cool. While known for their beer, they are a small scale wine and cider producer so if beer isn’t your thing they can cater to you also. The tastings are fairly comprehensive and reasonably priced so I would recommend stopping in if you are in the area. Forrest Brewing Company – Their fish and chips were top notch! These natural rock stacks do look pretty cool. However, they are so hyped up that when I first saw them I was very underwhelmed. I do think that they are worth going to see because the history behind how they got there etc. is quite cool but I think the trip actually getting to this point (and beyond) is much cooler. If I was to go back I think doing the helicopter ride would be the top of my list. Along the Great Ocean Road there are quite a few lighthouses. My favourite would be this one. There are a few walks around here, including up to the lighthouse and I think at certain times you can even do a tour of the lighthouse and get some pretty amazing views down to the marine reserve. There is also a (very) small chance of seeing whales here as they do come into the bay at certain times of the year. We weren’t so lucky, maybe next time? I would recommend coming up here earlier in the day because I think we only saw two people. One of my favourite stops on the second trip up the GOR was Sheoak Falls. Its only a short, easy walk from the carpark and well worth it. It was really quiet too which was lovely considering how busy the road can get! Fun Fact: To the left of this picture there is actually a guy sitting on the edge reading a book. Other waterfalls we didn’t manage to get to but would have loved to had we had more time were Erskine Falls & Phantom Falls. I would really recommend a trip down the Great Ocean Road and could really add about another million and one things into this post. If you do have any questions or want to know more about certain things, feel free to leave me a comment! Wow, so many beautiful places! Great Ocean Road is an awesome place to visit and this blog has been really helpful!! all photos are excellent, thank you for sharing with us.